In the New Order, we're accustomed to celebrating massive victories. It's only natural; we win big and win often. Indeed, the CODE always wins (always). However, the New Order also wins big by winning a lot of small victories, whose cumulative effect builds over time. 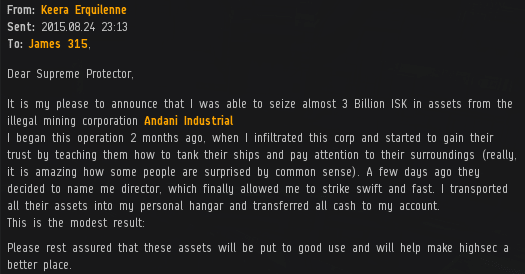 No one would think much, for instance, of dealing a crippling blow against a tiny little highsec mining corp like Andani Industrial. 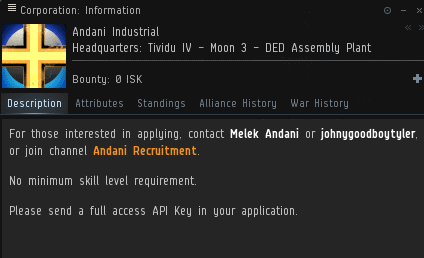 But the New Order seeks total Code compliance in highsec. Every violator, no matter how small, attracts the attention of our Agents. An awox alt of Keera Erquilenne's spent two months undercover in Andani Industrial. The spy subtly taught the miners some of the Code's wisdom and was eventually promoted to director status. Then our hero stole everything the corp owned. It wasn't much. 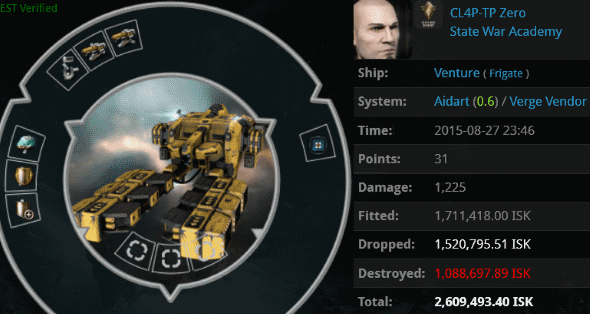 The combined assets of the newbie miners totaled only a few billion isk. Yet the goal of our Agent wasn't to get rich for personal gain; it was to teach the carebears a lesson. From their perspective, the loss was crushing, a disaster. Our Agents perform unheralded little heists like these every day. Meanwhile, in the Verge Vendor region, a Venture pilot named CL4P-TP Zero expressed negative opinions about the Code. CL4P violated the Code simply by having such opinions, but he made matters worse by sharing them in local. Agent Count Ragnar Danneskjold swiftly took command of the situation. If the miners were smart, they would cut out their nonsense and pay up. ...and they'll confess their guilt in no time at all. The miners condemned themselves by revealing the full extent of their madness. CL4P-TP Zero painted a target on his back by getting the ball rolling with his anti-Code talk. If his fate hadn't already been sealed, it certainly was when he challenged our Agent's bravery. Boom went the Venture. It had a bit of a tank, probably because another Agent had ganked his Venture a few days earlier. CL4P pouted, but still wouldn't pay. The next day, Count Ragnar Danneskjold returned and ganked CL4P's Venture once more. Judging by CL4P's killboard, he got the message. CL4P left highsec and began PvP'ing elsewhere. He didn't like the Code, but the Code saved him. Adding victory to victory, the interaction with CL4P and his rebel buddies won more hearts and minds to our great cause. Even with its thousands of posts, there isn't enough space in the pages of MinerBumping to share all of the New Order's victories. Highsec is filled with happiness, and it's all thanks to us! +10 for Agent Count Ragnar Danneskjold's Ayn Rand reference! I am basking in the warm glow of countless victories! 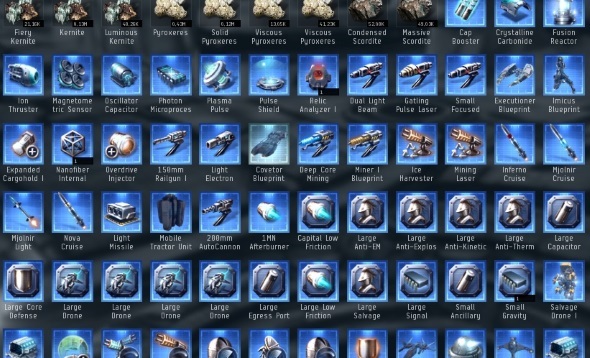 I remember this, i couldnt believe what I was seeing in local. The agents put up with a lot, they do a great job in the face of horrible behaviour by the miners, well done!